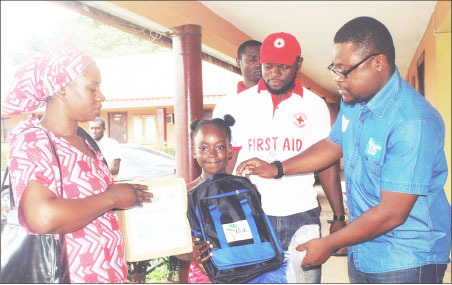 Gbenga George (far right), Corporate Social Responsibility Manager, FrieslandCampina WAMCO and Anthony Abah, (middle) Information Coordinator, Benue State Branch of The Nigerian Red Cross Society, presenting home and school supplies to a parent and her daughter as part of the company’s donations towards resettling flood victims in Benue State. A statement signed by Ore Famurewa, Corporate Affairs Director, said that FrieslandCampina WAMCO made the donations in conjunction with the Benue State Chapter of the Nigerian Red Cross Society on Saturday. “Prior to the disaster, FrieslandCampina WAMCO has maintained a long-standing relationship with the state, made evident in our adoption of Government College Makurdi, year-round upkeep of a charity home and our partnership on the Home Grown School Feeding Programme among other things,” said Ejesi.